Amazon has made a bid to buy Whole Foods in what would be a whopping $13.7 billion deal. The all-cash acquisition (which includes Whole Foods Market’s net debt), will radically shake up any number of businesses and completely changes the online retail and bricks and mortar landscape. Whole Foods will continue to operate stores under its brand and will use its same vendors and partners around the world. John Mackey will remain chief executive of Whole Foods the company’s headquarters will still be in Austin. The deal, which is subject to approval of Whole Foods shareholders and regulators is expected to close in the second half of 2017. The news, which was first reported by Bloomberg will have significant implications for any number of highly valued startup companies and the entire grocery industry. 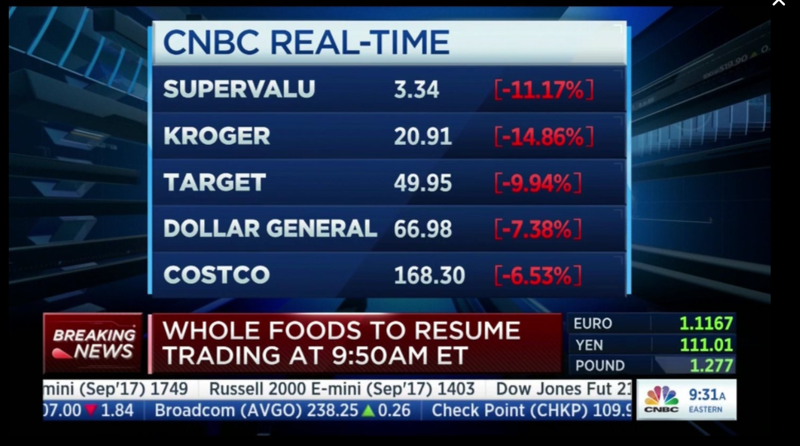 Already today most grocery store stocks have tumbled sharply in early morning trading (since everyone is afraid of the Seattle-based juggernaut). Something else to chew over is the fact that Amazon now has access to a massive network of bricks and mortar businesses — although the fact that Whole Foods will retain its brand and its chief executive seems to indicate that (at least initially) the two companies will operate fairly independently. Online sales of groceries grew by 15% over the last year to reach $48 billion, according to data from Kantar Worldpanel. By 2025 that number is expected to be $150 billion globally. There’s no word yet on what the deal would mean for Amazon’s reported plans to launch convenience stores selling perishable goods and the drive-in, pick-up locations for grocery orders. Late last year the Wall Street Journal reported on the company’s plan to expand its grocery reach beyond just Amazon Fresh. That plan (reportedly called “Project Como” among staffers) was intended to be rolled out to Amazon Fresh service subscribers. Amazon launched its grocery delivery service in 2007, but haltingly expanded the service in fits and starts. By June 2016 the service was only available in certain U.S. markets along the West Coast (Seattle and Northern and Southern California), along with New York, New Jersey, Philadelphia, Stamford, Conn., Baltimore and Boston. Internationally, the service was only available in London as of mid June last year. In an awkward bit of timing, the Amazon acquisition comes on the same day a patent the company filed has been revealed for a technology that would block price comparison searches on mobile devices in Amazon stores. Now, Amazon has access to Whole Foods’ network of roughly 430 brick-and-mortar locations… It’s not the national reach of some of America’s largest grocery store chains, but it’s significant enough for most chains (and every startup in the grocery delivery space to have concerns… I’d think). Venture investors have poured hundreds of millions of dollars into companies like Instacart, Shipt, Peapod and FreshDirect… and for those companies this has to be a major blow. Indeed, Instacart alone has raised nearly $700 million according to Crunchbase, from investors including Sequoia Capital, Kleiner Perkins Caufield & Byers, Andreessen Horowitz… and even Whole Foods. As Deliv chief executive Daphne Carmeli noted today, the deal is almost certainly a death knell for Instacart, unless Bezos and Amazon have intentions to acquire it through the ownership stake that Whole Foods already owns. Carmeli also noted that Amazon’s vertical integration through the Whole Foods deal makes it dominant in the grocery space and could accelerate the move to online shopping. And it puts further pressure on Walmart to speed up its integration with Jet’s services, Carmeli said. In retaliation Walmart just might pick up an online grocer of its own (a deal with Shipt might make sense — given its lower valuation and lean operations). With this acquisition I wonder if a lot of those deals become a lot less appetizing. And make the valuations for those companies a bit harder to swallow.